Hot air airships offer a phantastic compromise between the ease of use common to hot air balloons and the maneuvrability of real airships. Like balloons, hot air airships can be transported on a trailer. Their deflation does not involve the loss of expensive helium. An expensive hangar is thus superfluous. This does not mean that thermal airships are cheap. A standard pressurized model costs around US$ 100,000. Without a sponsor and commercial use such a price is out of reach for many pilots. Homebuilt Construction is a potential solution to the price barrier but experimental designs have yet to reach the performance level of commercial hot air airships. In most countries the legal requirements for piloting hot air airships are similar to the ones for flying hot air balloons. In the USA a hot air balloon pilot licence is the only requirement to fly a thermal airship. In Switzerland and England five additional hours on thermal airships under the supervision of an experienced hot airship pilot are required to get the rating (in addition to the normal hot air balloon licence of course). However, Swiss hot air airship pilot and instructor Felix Bühlmann recommends that prospective thermal airship pilots acquire at least 50 flight hours in hot air balloons before attempting the transition. There are a number of companies that manufacture hot air airships. They are Boland Balloon, Cameron Balloons, Lindstrand Balloons, and Thunder & Colt. You can recognize Cameron airships by their slight "belly." Seen head on they look somewhat like a tear drop because the gondola is attached via load tapes to the envelope only. This construction method brings simplicity and weight savings. Thunder & Colt and Lindstrand airships, on the other hand, have internal suspension cables running inside the envelope that attach the gondola to the top of the envelope. This supposedly makes for a more stable shape and better weight distribution but also increases the complexity of the design and its operation. Seen from the front those airships look more or less round. The gondola of a Cameron DP-Series airship. 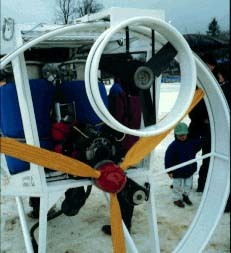 Note the auxiliary electrical fan to pressurize the envelope, provide fresh air for combustion of the propane and to inflate the rudder and tail surfaces. The advantage of this system is that there is an airflow even when the main engine is turned off during precision flights in competition. Also note the little red tank to feed the vapor pilot lights when the main tanks are pressurized with Nitrogen. Barely recognizable on the above picture is the König SC-430 three cylinder two stroke engine. It is used because of its high power to weight ratio and relative silence. Besides the König engines, Rotax powerplants are most often used in thermal airships. So far, two stroke engines have kept the upper hand because of their obvious weight advantage. And since airships stay in the air even in the event of engine failure, the reliability of two strokes has not been a primary issue. Two stroke engines have a reputation for being less reliable than four stroke engines, probably just because less research time and maintenance money gets spent on them. Recently however, some small and light four stroke engines have surfaced and might give two stroke engines some competition in very light aviation, including hot air airships. Most hot air airships flying today (especially in competition) are pressurized models. The internal pressure makes the envelope more rigid and prevents "denting" of the nose at higher speeds. The downside of pressurization is that the burner, located inside the envelope cannot draw fresh air freely from the outside. 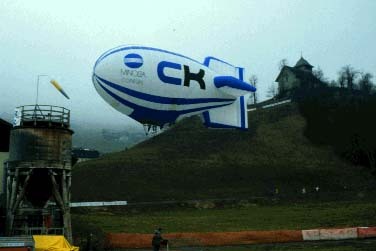 This is the Minolta CK airship piloted by Guy Moyano, 1992 World Champion from Luxembourg. It's a Cameron DP-80. Note the windsock. The ship is landing with its nose pointing into the wind. Facing into the wind is especially important for inflating, landing and deflating hot air airships because the envelope offers the smallest resistance to the wind that way. Also, the control surfaces are most effective when heading directly into the wind since this increases apparent airspeed and thus the amount of air that flows over and is deflected by the control surfaces. Despite their large surface area, the rudders of hot airships are not very effective at low speeds.